With less than two months left till the fourth Growth Investor Awards on November 7, the competition for the crown of the Growth Champion is in full swing. The prestigious accolade is sponsored by Smith & Williamson for the third consecutive year. The frontrunners have been described by the judges as paragons of productivity. They impressed the panel with the meteoric level of growth achieved by combining alternative investment capital with a brilliant development strategy. Between them, the finalists have received over £400m of investment. They employ 1438 people and have generated a turnover of £140m. To scoop the blue-ribbon of the Growth Champion, the finalists now have to impress a panel of experts and the public. 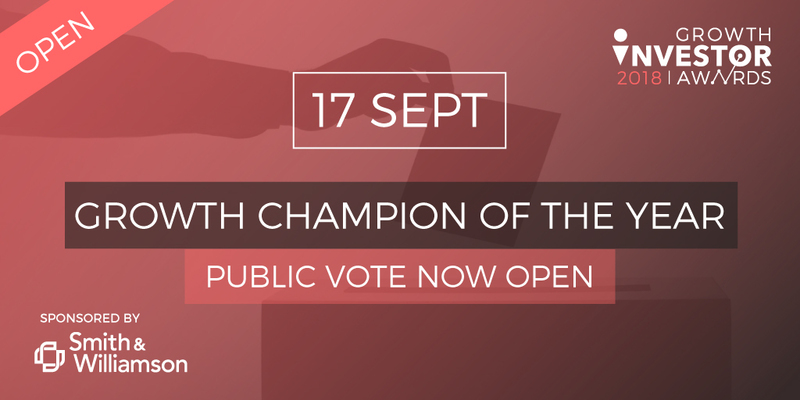 The public vote will be open from Midday September 17 till October 1 and its results will make up for 20% of the final score of each finalist. You can cast your vote by visiting growthinvestorawards/vote. You can watch interviews with the founders and senior management of the shortlisted companies below. ASI Data Science specialises in applying artificial intelligence to real world issues. The company has completed close to 300 commercial data science projects with organisations like the BBC, Home Office, TfL, easyJet and John Lewis. AVID is a clean-tech designer and manufacturer of electrified powertrain components and systems for heavy-duty and high-performance electric and hybrid vehicles. P2P global social shopping app Depop allows its users to track what their friends and followed influencers are liking, buying and selling. Gousto supplies subscribers with kit boxes packed with ready-measured fresh ingredients and easy-to-follow recipes. It has been voted best recipe kit service by the leading media outlets. Monica Vinader is a UK jewellery brand selling personalised necklaces, pendants, earrings, rings and friendship bracelets. The company’s vision has always been to bridge the gap between fashion and fine jewellery. Push Doctor is an online medical consultation service in the UK. It currently connects its subscribers for a secure online video consultations with over 7000 General Medical Council-registered GPs. Quiqup is a London-based logistic company providing on-demand delivery services via a network of over 2000 self-employed drivers. Revolut is on a mission to turn the banking sector on its head. It offers app-based current accounts allowing its users to spend money abroad and transfer money globally for free in 24 currencies. Thoughtonomy is a software company providing an automation technology platform Virtual Workforce. It uses software to replicate the way people work in existing applications and systems, the processes they follow, and the decisions they make, to deliver automation without disruption. Launched in 2016, the Growth Champion of the Year award recognises scale-up businesses and their founders or CEOs. The competition is open to any UK-based scale-up with a turnover of £3m+ in the last financial year that has best used alternative investment to grow. The winner will be announced at an exclusive black-tie awards dinner for 450 guest on Wednesday November 7 at the Royal Lancaster Hotel in London. Visit growthinvestorawards.com/finalists for a full list of all finalist and information how to attend the event.